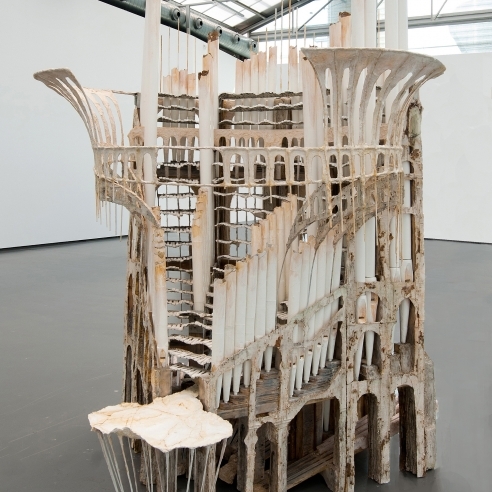 Diana Al-Hadid's sculptures are constructed in Baroque architectural forms, such as towers, mazes and church organs, which appear to be in ruins. 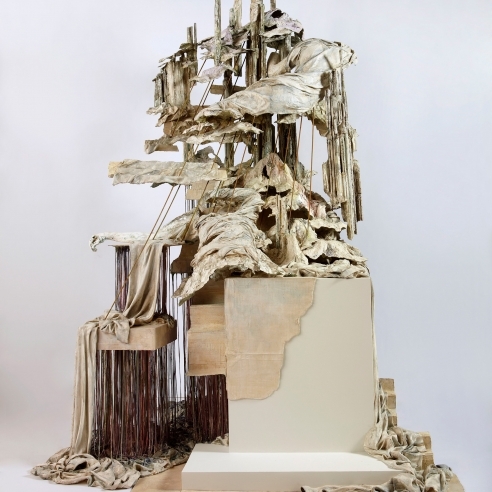 Using materials like cardboard, plywood, plaster and resin, her works are replete with influences from and references to ancient Biblical and mythological narratives, both Eastern and Western, Arabic oral traditions, Gothic architecture, Western icon painting, Islamic decoration and scientific advances in physics and astronomy. 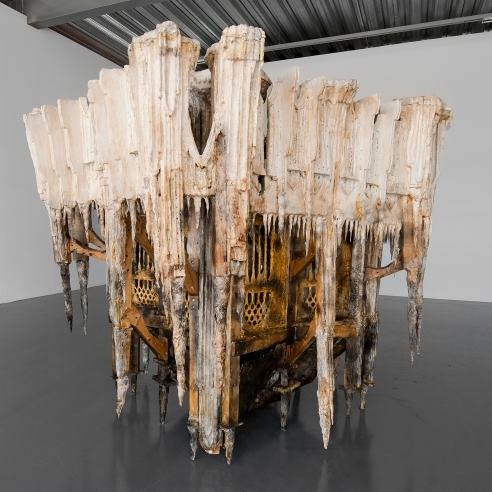 In the words of Anne Ellegood, her sculptures are like the "silent catastrophes" of Robert Smithson, moments of disaster and decline frozen in time and space. 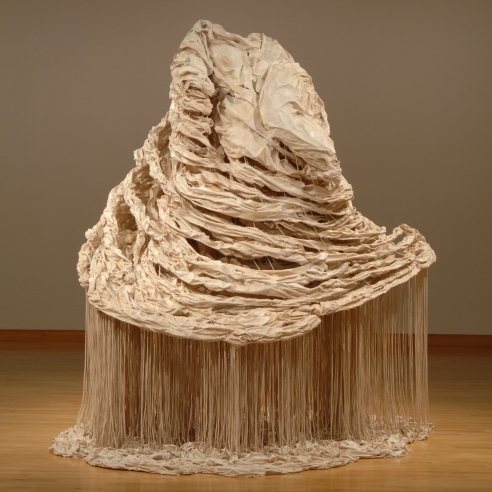 Her enormous and tremendously elaborate sculptural constructions become what the artist herself calls "impossible architectures". Diana Al-Hadid's journey begins in Brooklyn, where she lives and works, and extends via Madrid, Murcia and Mallorca. 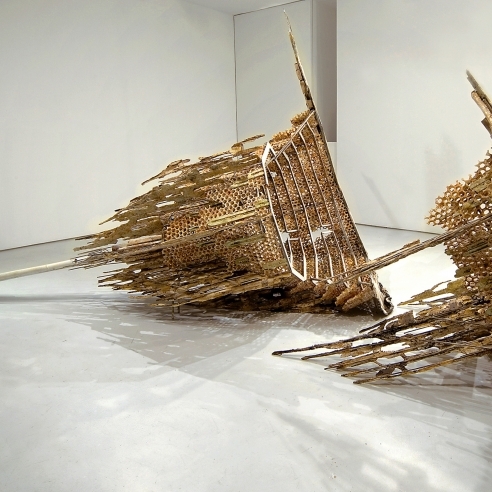 It is a journey in which this Syrian-born artist seeks the Islamic roots of what was once Mursiya. Her visits to the Museo de Santa Clara, a former Hudi palace and an excellent example of the period of transition between Almohad and Nasrid art, and to Murcia cathedral, consecrated in 1467, are essential references underlying the conception of this show. Two items from these two visits, curiously both music-related, made a deep impression on Al-Hadid. At the Museo de Santa Clara there is an important painting in tempera on stucco of a flautist (Flautist: Palace of the Wolf King, tenth century), an adaraja (toothing) belonging to a Mocárabe cupola dating from the second period of taifas (1147-1172), discovered in 1985 during the archaeological excavation carried out in the former refectory of the Convent of Santa Clara la Real in Murcia and situated at a level corresponding to the Palace of Muhammad ibn Mardanish (Peñíscola, 1124-Murcia, 1172), King of Murcia (1147-1172), known by the Christians as the Wolf King. In Murcia Cathedral is the magnificent organ built by Joseph Merklin in Paris in 1856, currently in use following its restoration in 2008. Al-Hadid's journey focused not only on discovering a city containing traces of its Islamic past but also echoes of an earlier life; works from the past began to resonate in her memory, becoming postcards from previous journeys of references that she saw everywhere, curiously, during her visit to Murcia. 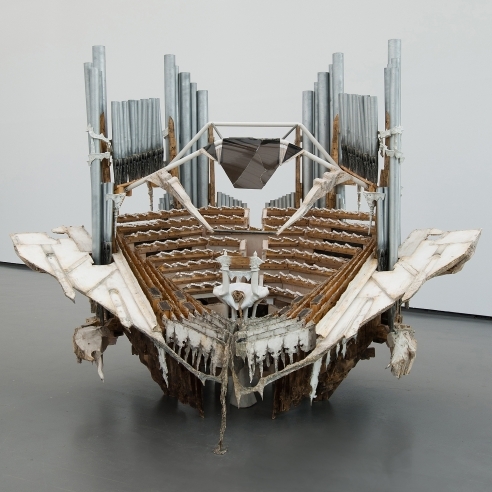 The exhibition comprises five large-scale sculptures dating from between 2006 and 2010 and a sixth created for this show following her Spanish odyssey just this year. The title of this exhibition, Play the Wolf Fifth, references many of these ideas. Starting from a tribute to the Wolf King, the selection of works resembles a pack of wolves marking out their territory by howling in a beautiful chorus. This strangely harmonious song, all on the same note, creates the impression that the pack has more members than is really the case. This is related to the musical phenomenon of the "wolf fifth", an anomalous interval, slightly larger than a pure fifth, which occurs in the tuning systems used in the Renaissance and Baroque periods. The difference is quite marked, and the wolf fifth seems to "howl" out of tune - hence its name. The exhibition plays this interval, with each sculpture somehow marking out its own territory.